There are many techniques for handling nulls. 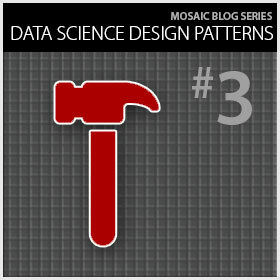 Which techniques are appropriate for a given variable can depend strongly on the algorithms you intend to use, as well as statistical patterns in the raw data—in particular, the missing values’ missingness, the randomness of the locations of the missing values. [i] Moreover, different techniques may be appropriate for different variables, in a given data set. Sometimes it is useful to apply several techniques to a single variable. Finally, note that corrupt values are generally treated as nulls. Missing completely at random (MCAR) values are randomly drawn from the sample, independent of other variables. Missing at random (MAR) variables are randomly distributed, conditional on other variables. Missing not at random (MNAR) variables’ missingness still depends on the missing values, even conditional on other variables. Classes of techniques. Techniques for handling nulls fall into four classes (in increasing order of sophistication): null deletion, naïve central-value estimators, other algorithm-independent functions, and algorithm-specific functions. All but the first replace a null with a surrogate value computed by some means. Null deletion. Here one merely deletes null values, or the records containing them, from the original data set. In case-wise deletion one deletes all records containing null values. In pairwise deletion one only deletes records containing null values of variables used by a specific analysis. Algorithm-independent surrogates. A more sophisticated way to compute a surrogate value is to use a predictive algorithm to estimate the missing value, independent of the algorithms you might use later to analyze the data. We have already seen that smoothing is one way to handle missing data. It applies, in particular, when insufficient history has accrued to distribute mass over a source variable’s set of possible values; we then redistribute probability mass from observed to missing values. (See design pattern #2 for details.) Other approaches include variants of regression, Bayesian conditioning, and maximum likelihood. When the nulls are not missing at random, it may be necessary to account for the non-randomness in the predictive model used to compute surrogates. The third approach is the interesting case. (The other approaches are trivial to execute. In particular, the fourth approach is generally built into the implementation of the analytical algorithm, so one can treat the algorithm as a “black box.”) The general procedure is to use the non-null sample values to build a model that predicts a variable having missing values, and then substitute the model’s predictions for each missing value of that variable. Repeatedly (m times) impute values to each missing variable, yielding m complete data sets. Analyze the m data sets to produce m sets of parameter estimates. Pool the m estimates into a single set of parameter means, variances, and confidence intervals. You are confident that the null values are MCAR. The data are sufficiently abundant, or the records containing nulls are sufficiently sparse, so that your sample size will not change substantially as a result of deleting those records. In this case deleting nulls is a fast way to get past them. Otherwise, null deletion distorts the source data’s distribution, causes detrimental data loss, or both. The number of null values is small. The distribution has a small variance (so that most of its values are near the mean). In such cases substituting a central value should have a small effect on the analysis. When in doubt, you may wish to perform a sensitivity analysis, to check that the choice of surrogate value does not substantially alter the results. Algorithm-independent vs. algorithm-specific surrogates. We encourage you to use algorithm-specific techniques when they exist, and otherwise to use robust algorithm-independent techniques such as MI. Either approach generally improves substantially on the naïve and null-deletion alternatives. Construct a sample of body weights for a large population of both males and females between the ages of 10 and 90, modeled as a function of age and gender, with some Gaussian noise added to the weights. Deletes 10% of the weight values. Imputes several naïve estimators to the missing values. 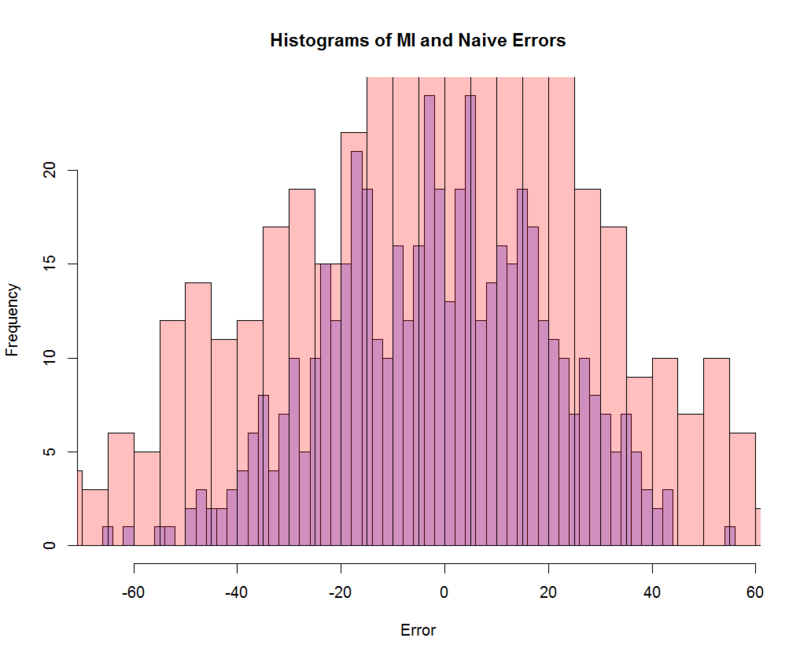 Uses a linear-regression MI algorithm in the R Hmisc library to estimate the missing values. Compares the naïve (mean imputation) and MI results. # Generate a random sample of individuals having age, gender, and weight. # Make a copy of the weight data, for later reference. # Make m weight values go away, choosing the locations MCAR. See Stekhoven (2011)[vii] for examples of nonparametric null imputation using a random-forest algorithm (in R’s missForest package). [i] R.J.A. Little & D.B. Rubin, Statistical Analysis with Missing Data (Wily, 1987); P.D. Allison, Missing Data (Sage, 2001); D.C. Howell, “The Analysis of Missing Data,” Handbook of Social Science Methodology (Sage, 2007); and A.N. Barladi & C.K. Enders, “An Introduction to Modern Missing Data Analyses,” Journal of School Psychology 48 (2010), pp. 5-37.
http://www.stat.columbia.edu/~gelman/arm/missing.pdf (visited March 2, 2014). [iii] For example, see http://www.stat.berkeley.edu/~breiman/RandomForests/cc_home.htm#missing1 and http://cran.r-project.org/web/packages/missForest/missForest.pdf (visited March 2, 2014). [iv] Multiple imputation averages estimated parameters over multiple runs of the estimation model, each of which uses different imputed values, to build the final estimation model. See Stef Van Buuren, Flexible Imputation of Missing Data (Chapman & Hall, 2012). [v] Van Buuren lists nearly 20 related R libraries alone at http://www.stefvanbuuren.nl/mi/Software.html (visited March 2, 2014). [vi] Several important classes of distributions do not have central values. The uniform distribution is a trivial example. Lévy-stable distributions with α ≤ 1 don’t have means. See John P. Nolan, Stable Distributions: Models for Heavy-Tailed Data (Birkhauser, 2013), available in part at http://academic2.american.edu/~jpnolan/stable/chap1.pdf (visited March 2, 2014). The Cauchy distribution is one such heavy-tailed distribution. Its mean and variance are undefined. See http://en.wikipedia.org/wiki/Cauchy_distribution (visited March 2, 2014). Lévy-stable distributions occur in financial modeling, physics, and communications systems. Where a variable is the sum of many small terms, e.g. the price of a stock or the noise in a communications signal, it may have a stable distribution. [vii] http://stat.ethz.ch/education/semesters/ss2012/ams/paper/missForest_1.2.pdf (visited March 2, 2014).